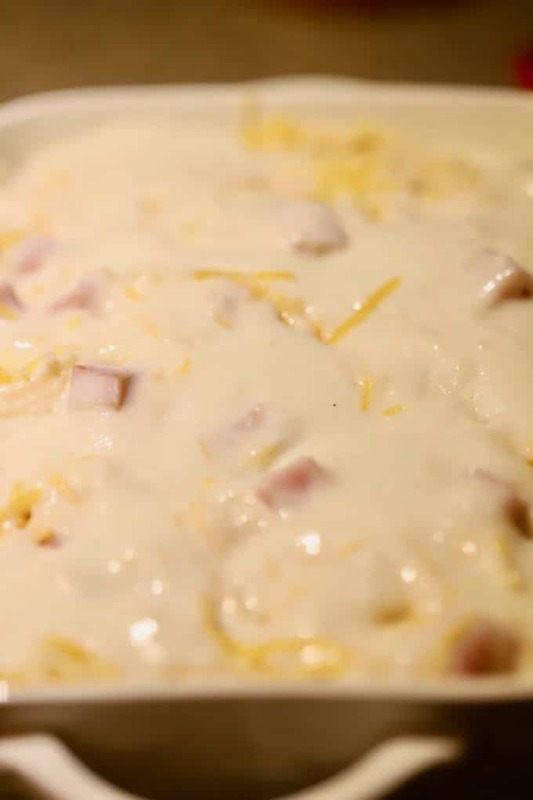 The Best and Easiest Au Gratin Potatoes and Ham Recipe is a classic entrée. Made with leftover ham it’s a staple on many holiday tables. It also solves the age-old question of what to do with all that leftover ham! 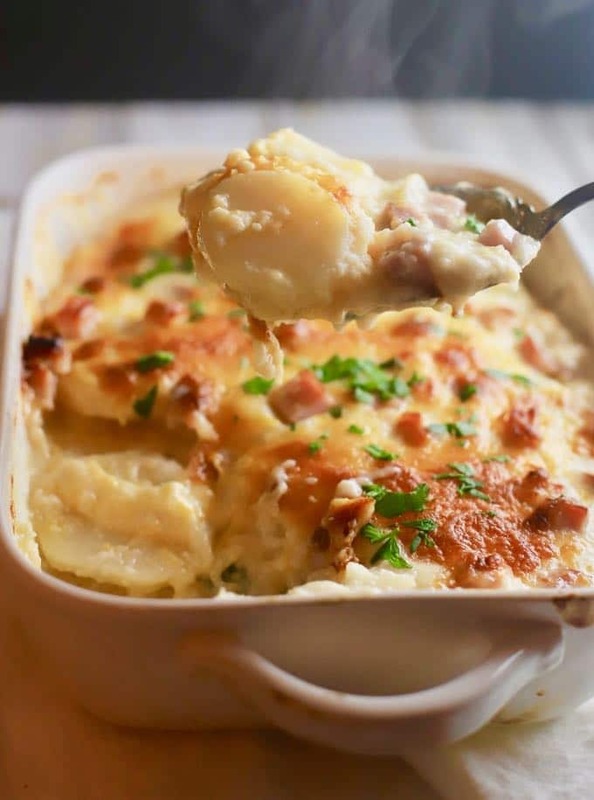 I’m excited to share this cheesy dish of deliciousness, Easy Au Gratin Potatoes and Ham. This recipe is not only a family favorite, but it’s also fancy enough to serve guests. When my children were young, this was one of their favorite dinners, and I made it often. And, I still do, especially around the holidays when we are likely to have leftover ham in the house. I love ham, and I love to serve it because then I have leftover ham. 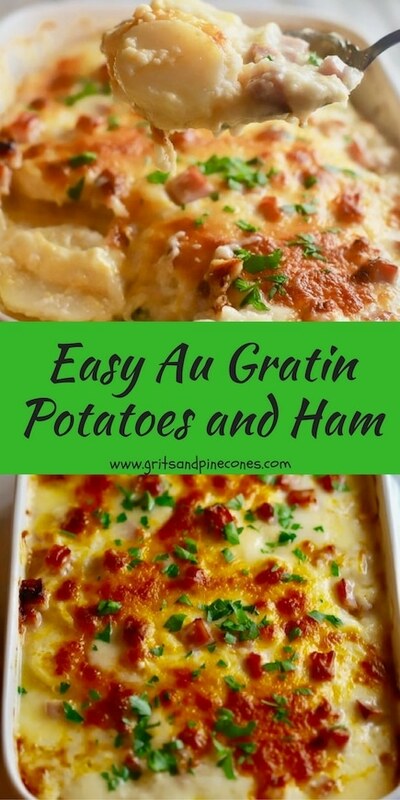 Easy Au Gratin Potatoes and Ham is my favorite way to use up my leftover ham. Plus, I always cut up leftover ham chunks and freeze them to use as a flavoring for collard and turnip greens and peas. I confessed in another post that I never met a mashed potato recipe I didn’t like. Well, the reality is, I never met a potato dish I didn’t like, and this recipe for au gratin potatoes is no exception. 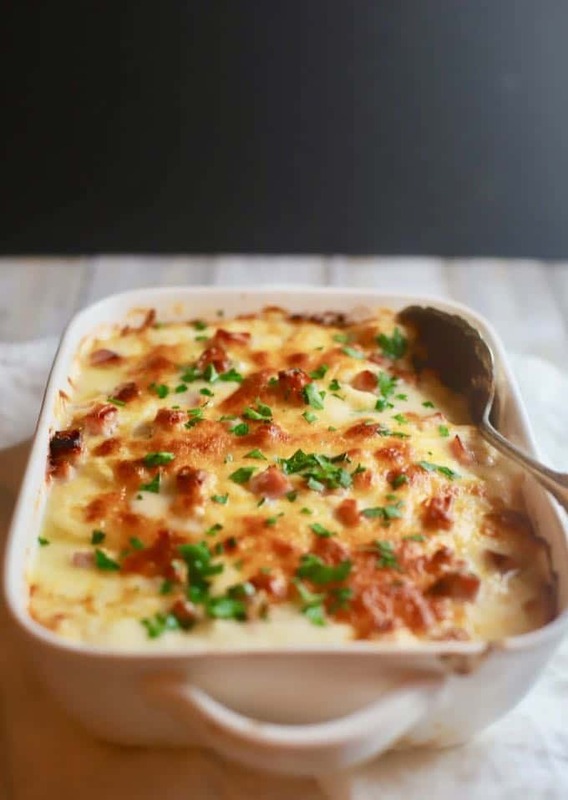 This scrumptious Easy Au Gratin Potatoes and Ham casserole is also known as cheesy scalloped potatoes and ham and is pure comfort food nirvana! I guarantee it will quickly become one of your family’s favorites too! What’s the difference in scalloped potatoes and au gratin potatoes? Most folks usee the terms scalloped potatoes and au gratin potatoes interchangeably. Officially the main difference is whether the dish contains cheese or not. Generally, scalloped potatoes don’t contain any cheese and au gratin potatoes do. However, I’ve had plenty of scalloped potatoes with cheese so whether you call them scalloped potatoes or au gratin potatoes you will be getting a rich creamy potato casserole most likely with cheese. As an example, my Southern Cheesy Scalloped Potatoes is loaded with cheese, as is my Easy Parmesan Potatoes Au Gratin, and Ultimate Blue Cheese Potatoes Au Gratin. Easy Loaded Crispy Potato Skins. To get started, gather your ingredients which include: butter, onion, flour, milk, pepper, potatoes, ham, Monterey Jack and Cheddar cheeses, and parsley for garnish. Add butter and finely minced onions to a large skillet over medium-low heat and saute about 10 minutes until the onions are soft and translucent. Wash and scrub the potatoes. Then use a mandolin or your food processor and slice the potatoes as thinly and as uniformly as possible. I usually leave the skins on. The thinner the potato slice, the quicker this casserole cooks. You can also use a sharp knife to slice your potatoes. Cut up the ham into cubes. Once the onions are done, sprinkle flour over them and whisk to combine. I use Julia Child’s rule of thumb here for the white sauce which is 1 1/2 Tbsp of flour for every 1 cup of milk or liquid. Continue cooking the onion and flour mixture until the flour is golden brown, about 2-3 minutes. Slowly add the milk and continue whisking to prevent lumps. Cook until the sauce has thickened which usually only takes a few minutes. Add pepper, mix well and remove from the heat. 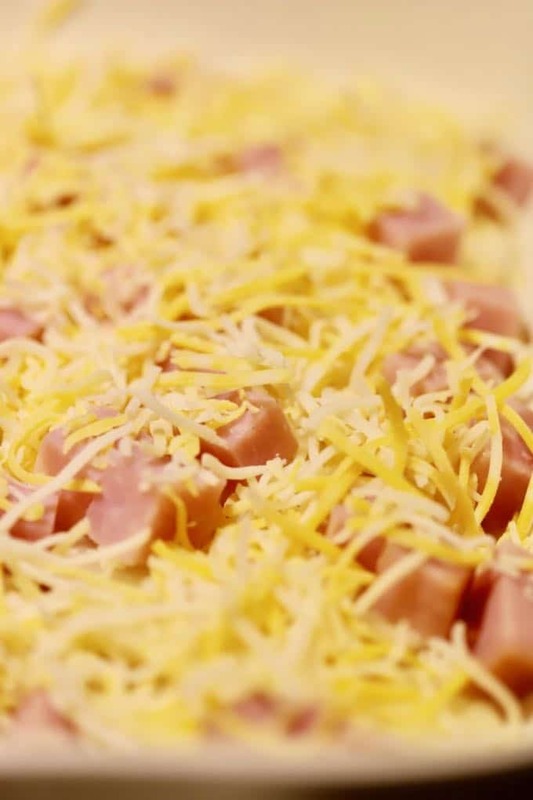 You can add a pinch of salt at this point, but with the cheese and ham, this dish is already pretty salty. Spray a medium-size casserole dish with non-stick cooking spray or butter the dish. Add half of the sliced potatoes, then half of the cubed ham, and about half of both kinds of grated cheese. Pour on half of the sauce. Repeat the next layer with the remaining potatoes and ham, pour the remaining sauce over the top and sprinkle with the remaining cheeses. Cover the baking dish tightly with aluminum foil and bake at 350 degrees for 40-60 minutes. How long it takes depends on the thickness of the potato slices. Remove the foil and test to see if your potatoes are done, by piercing them with a fork. If not done, continue cooking for another 10 minutes or so. Once the potatoes are fork tender, remove the foil completely and bake for another 20-30 minutes, or until the sauce is bubbling and the cheese is golden brown. You can also add leftover ham to quiches, frittatas, and breakfast casseroles, soups, chowders and stews, and of don’t forget the classics, ham and cheese sandwiches, Cuban sandwiches, or ham club sandwichs. 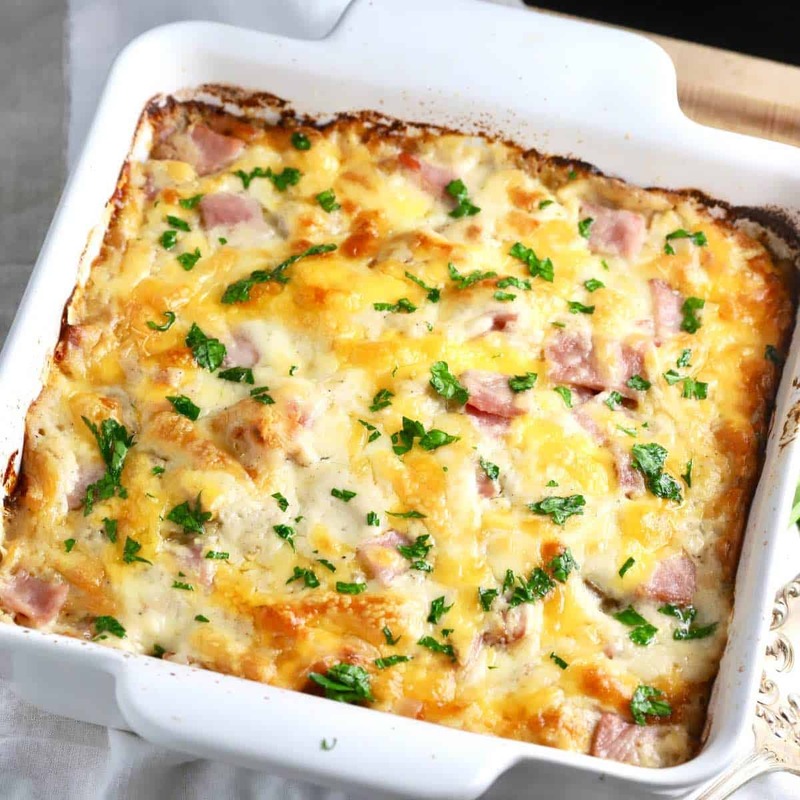 Easy Au Gratin Potatoes and Ham is a cheesy dish of deliciousness which is perfect for a quiet weeknight family dinner, yet fancy enough to serve guests. It's also a perfect dish to use up leftover ham. Add butter and minced onions to a large skillet over medium-low heat. Cook about 10 minutes until onions are soft and translucent. Meanwhile, slice the potatoes and cube the cooked ham. Sprinkle flour evenly over the onions and whisk. Continue cooking this mixture about 2-3 minutes until the flour is light brown. 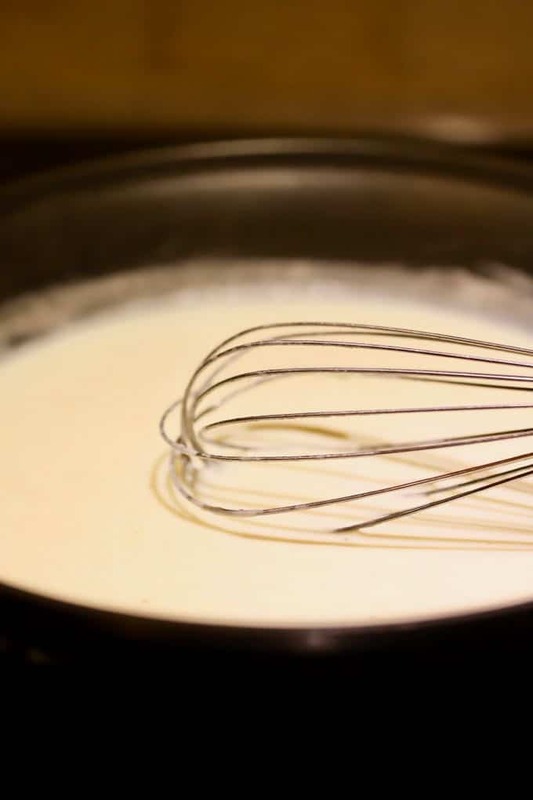 Slowly add milk whisking constantly to prevent lumps. Continue whisking until the mixture thickens which should be in about 3-4 minutes. Add pepper and a pinch of salt if desired, mix well and remove from the heat. Spray baking dish with non-stick cooking spray or grease with butter. Add half of the potatoes, top with half of the ham and sprinkle with 1/2 cup of both the Cheddar and Monterey Jack cheeses. Pour half of the sauce over the top. Add the rest of your potato slices, the rest of the ham, and cover with the remaining sauce. Top with the remaining cheeses. Cover the dish tightly with foil and bake for approximately 40-50 minutes. The thickness of the potato slices determines how long this will take. Remove the dish from the oven and pierce the potatoes with a fork. They are done when you can easily pierce them with a fork. When the potatoes are done, remove the foil and continue baking for an additional 20-30 minutes or until the sauce is bubbling and the cheese is browned. Remove from the oven and garnish with chopped parsley before serving. You can also add leftover ham to quiches, frittatas, and breakfast casseroles, soups, chowders and stews, and of don't forget the classics, ham and cheese sandwiches, Cuban sandwiches, or ham club sandwichs. I had 4 cups of ham so I doubled the sauce. It’s still in the oven. I also used up the last of the gruyere cheese I had. We’ll see! I thought it looked good enough to try. Didn’t work at all with it covered. I wouldn’t try this recipe again, sorry. Thank you for leaving a comment and I’m so sorry you had a problem with this recipe. I’m not sure what you mean by “it didn’t work at all with it covered”, but I cover the dish with foil to help the potatoes cook evenly without drying out. And then when the potatoes are mostly done, I remove the foil to lightly brown the cheese topping. The amount of time the potatoes take to cook all depends on how thick or thin your slices are and I think if it is cooked for the entire time without being covered, the dish would be dry. If your potatoes were not done, just recovering them and baking them for a little longer should have fixed that. I know how much time and effort it goes into making a dish like this and I am sincerely sorry, yours didn’t turn out as you hoped it would. What a perfect comfort food for this Fall season. This looks so creamy and delicious! Just pulled the leftover Christmas ham out of the freeaer a couple of days ago and made ham and bean soup. Still plenty of ham left so I’m going to make this tonight! Probably use up some half and half in my fridge for part of the milk (I hate wasting anything!) and cant resist adding a little garlic. Can’t wait to smell it cooking and then to eat it! Your golden brown cheesy goodness photo is making my mouth water already! Thanks so much for leaving me a comment. I love your idea of adding garlic and have to say reading your note made my mouth water and wish I had some leftover ham!